Check out iTricks new magic to keep up to date with the latest magic releases. Subscribe to the RSS feed to get up to the minute information on new magic. Have a new effect, book, DVD or other magic product on the market? *Please include a product description, price, availability and any photos and video links. A colony of ants attack a signed card. A card is selected and the spectator’s favorite food is drawn on its face. The card is lost in the deck and the performer’s hands are shown to be empty. The cards are spread face down and one is seen to be covered in printed ants. The card is turned over to show that it is in fact the selected card. With a flick the printed ants fall off the card and shower down into the spectator’s hands. The card is then given to the spectator to keep. ANTTACK is perfect for leaving that lasting impression on your audience. Starts with the emotional attachment to food and end with a surprising fist-full of ants. Includes gimmicks with a detailed, fully-illustrated instruction manual. Effect: You hand the thumb stocks to a spectator. Instruct him to loosen the nut that hold the two halves together. The spectator places their thumbs into the holes and the nut is tightened snugly. The spectator can not remove their thumbs. You loosen the nut and place your thumbs into the stocks and then the spectator tightens the nut to make sure you can not escape. You are then able to perform many different in and out escape routines and stunts. Perfect for comedy or serious routines. These are custom precision made solid aluminum thumb stocks. These are specially made for you to be able demonstrate your escape abilities. Many routines are possible. Now you can perform Needle Through Arm whenever, wherever, STAT! The STAT Needle Thru Arm Gimmick looks like one of those alcohol pads from a First Aid Kit, you know, sealed in a little aluminum pouch. In reality, it’s rubber cement! Setup right in front of your audience! There’s no need to treat your skin in advance. Tear open the “alcohol” swab and dab it on during the routine. Folks will just think you’re prepping your arm for the needle! In fact, these look so real you can even use them on a member of the audience. Needle Through THEIR Arm! • Rip open a miracle STAT! • High impact magic now impromptu! • Easy to carry pouches fit in your pocket! • Perform STAT on yourself or your spectator! 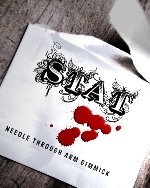 The STAT Needle Through Arm Gimmick includes 15 disposable pouches, ready to go! You’ll need to have your own needle, stage blood, and routine, this is simply a refill pack to keep you performing one of the greatest tricks on earth! Availability Notice! The STAT Needle Thru Arm Gimmick is offered here as a preorder and is not in stock. It will ship with the rest of your order Friday the 14th. There is a VERY LIMITED SUPPLY. First come, first shipped! Preview Experience:20The Magic of Jon Allen for free! This 15-page ebook contains a glimpse into the pages of this great new book. You’ll get to read the publisher’s introduction, plus learn three great previously unpublished tricks. iTricks.com New magic is proudly powered by WordPress.